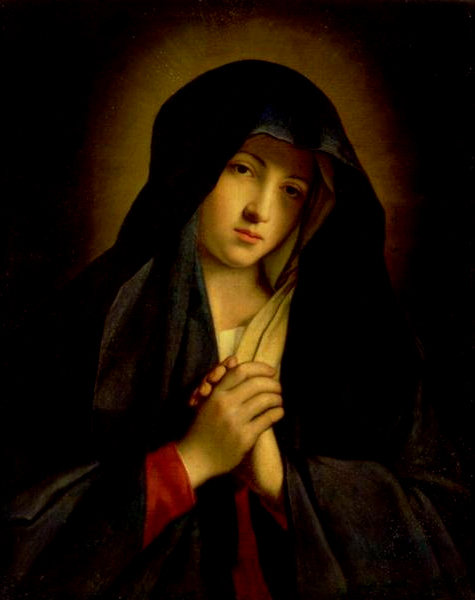 O most holy and afflicted Virgin! Queen of Martyrs! Thou who didst stand motionless beneath the Cross, witnessing the agony of Thy expiring Son-through the unceasing sufferings of Thy life of sorrow, and the bliss which now more than amply repays Thee for Thy past trials, look down with a mother’s tenderness and pity on me, who kneel before Thee to venerate Thy dolors, and place my requests, with filial confidence, in the sanctuary of Thy wounded heart; present them, I beseech Thee, on my behalf, to Jesus Christ, through the merits of His own most sacred death and passion, together with Thy sufferings at the foot of the cross, and through the united efficacy of both obtain the grant of my present petition. To whom shall I resort in my wants and miseries if not to Thee, O Mother of Mercy, who, having so deeply drunk of the chalice of Thy Son, canst compassionate the woes of those who still sigh in the land of exile? Offer for me to my Savior one drop of the Blood which flowed from His sacred veins, one of the tears which trickled from His divine eyes, one of the sighs which rent His adorable Heart. O refuge of the universe and hope of the whole world, do not reject my humble prayer, but graciously obtain the grant of my petition.